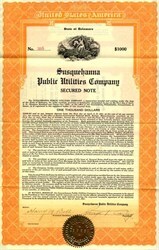 Beautifully engraved uncancelled $1,000 Bond Certificate from the Susquehanna Public Utilities Company issued in 1932. 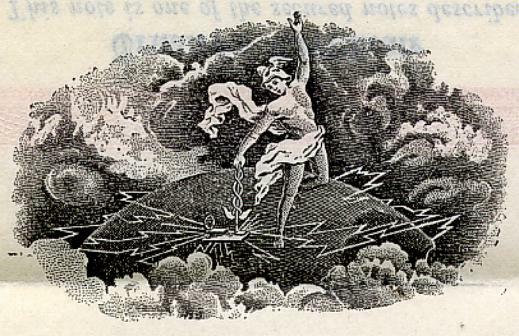 This historic document was printed by the William Mann Company and has an ornate border around it with a vignette of Mercury in the clouds with lightning bolts This item is hand signed by the Company's President, George T. Carley and Secretary, Harry T. Bobb and is over 73 years old. The certificate is signed on the back by Edmund S. Fritz, President of the Central Jersey Power Company as Trustee.